A Welsh Government minister has called for Labour to campaign "unashamedly" to use its income tax varying powers in the next assembly elections. Jeremy Miles, Counsel General and Brexit minister, told party members voters would be making a choice on both spending and taxation plans. Powers to vary income tax by 10p in every band were devolved this year. Putting 1p per pound on the basic rate of income tax would raise about £200m for the Welsh Government. The First Minister Mark Drakeford, who was elected in December, said he would abide by Labour's 2016 manifesto promise not to raise income tax in this assembly term "unless I am compelled to do so". Could taxes also change our behaviour? The party has not yet made any definite commitments to how it might approach the new income tax varying powers if it wins the 2021 election. 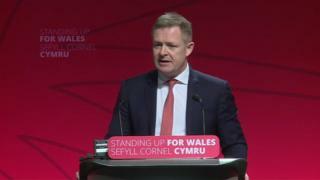 But Mr Miles told his party's Welsh spring conference in Llandudno he firmly believed "we will unashamedly be making the case for using those powers". When he was campaigning for the Welsh Labour leadership, Mark Drakeford said he supported raising taxes to pay for social care. Mr Miles' call for income tax rises may go beyond that as he told BBC Wales he would support income tax rises "in certain circumstances". Whether you end up paying more in income tax after 2021 is an open question at the moment. Welsh parties are a long way from finalising their manifestoes for assembly elections that are two years away. But Jeremy Miles has made the strongest call yet for Welsh Labour to go into those elections campaigning to ask you to pay more to fund public services. Other senior Welsh Labour figures have talked about the possibility of income tax rises to fund social care specifically, but Mr Miles has gone further than that. He's also regarded as one of the leading figures to succeed Mark Drakeford as Welsh Labour leader when Mr Drakeford decides to step down. And we know - because he's already told us - that Mr Drakeford doesn't want to do a long stint at the helm. As Brexit minister, Mr Miles also warned conference delegates that simply telling leave voters they got it wrong misunderstands their decision. He said his cabinet colleagues had tried to reconcile Wales' vote to leave, while shielding the country from economic damage. The Welsh Government wants a close economic relationship with the EU. But many in Labour are calling for a new referendum on Brexit. Most Welsh voters backed leave in the 2016 referendum - Labour had campaigned for remain. "However passionately we may have wanted a different outcome, simply telling people they got it wrong profoundly misunderstands the roots of that decision," said the minister. "The deep sense of many people - many of our people - is that politicians are just not listening to them." Brexit is dealt with at Westminster rather than Cardiff, but Welsh ministers take part in frequent talks with UK counterparts on the issue. They have lobbied the UK government to ensure "continued full and unfettered access to the single market and participation in a customs union". First Minister Mark Drakeford has supported the concept of a further referendum, but only if a resolution cannot be found in the House of Commons. It is a different tone from health minister Vaughan Gething, who told BBC Wales in March that another referendum should take place. On Saturday UK Labour leader Jeremy Corbyn said the real divide in society was between rich and poor, not between supporters and opponents of Brexit.